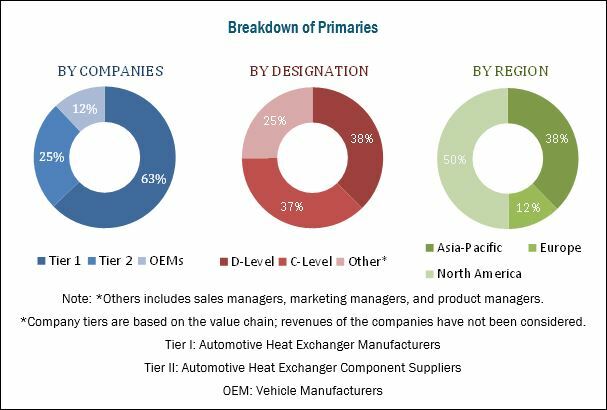 [134 Pages Report] The automotive heat exchanger market was valued at USD 17.94 Billion in 2016 and is projected to reach USD 32.05 Billion by 2025, at a CAGR of 6.61% during the forecast period. The base year for the report is 2016 and the forecast period is 2017 to 2025. The research methodology used in the report involves primary and secondary sources and follows a bottom-up approach for data triangulation. The study involves the country-level OEM and model-wise analysis of automotive heat exchanger market. This analysis involves historical trends as well as existing market penetrations by country as well as vehicle type. The analysis is projected based on various factors such as growth trends in vehicle production and adoption rate by OEMs. The analysis has been discussed with and validated by primary respondents, which include experts from the automotive industry, manufacturers, and suppliers. Secondary sources include associations such as China Association of Automobile Manufacturers (CAAM), International Organization of Motor Vehicle Manufacturers (OICA), European Automobile Manufacturers Association (ACEA), Environmental Protection Agency (EPA), Society of Indian Automotive Manufacturers, SAE International, and paid databases and directories such as Factiva. The ecosystem of the heat exchanger market for automotive consists of automotive heat exchanger manufacturers such as Denso (Japan), Mahle (Germany), Dana (US), Valeo (France), Hanon (South Korea), Calsonic Kansei (Japan), and Sanden (Japan). The automotive heat exchangers are supplied to the automotive OEMs. Increase in demand for HVAC system in high-end commercial vehicles and off-highway vehicles are driving the automotive heat exchanger market and is expected to be close to USD 32.05 Billion by 2025. A heat exchanger is a device that is designed to transfer/exchange heat from one end of a vehicle to the other. The medium most commonly used are fluids, materials, and metals with good heat transfer properties. In automobiles, the heat exchanger plays a crucial role in the functioning of an engine and other components of the vehicle. Heat exchangers are used to maintain the required operating temperature in the engine and other components of the vehicle. However, they are not only used in heating applications but are also in cooling applications such as air conditioners. The increasing demand for electric and hybrid vehicles will eliminate the need of conventional heat exchangers such as radiators, oil coolers, intercoolers, and EGR coolers however, battery thermal management system will drive the automotive heat exchanger market for EVs. OEMs are focusing to improve the electric vehicle range, how this shift will impact the market demand for battery thermal management system segment of the heat exchanger market in future? How changing vehicle emission norms and improvement in vehicle fuel efficiency is a affecting the demand for automotive heat exchanger market? How are the industry players addressing these challenges? The automotive heat exchanger market is projected to grow at a CAGR of 6.61% from 2017 to 2025. The market for automotive heat exchangers is estimated to be USD 19.21 Billion in 2017 and is projected to reach USD 32.05 Billion by 2025. The key growth drivers of this market are the increase in demand for HVAC system in high-end commercial vehicles and off-highway vehicles and the increase in vehicle production. The air conditioning system segment is estimated to hold the largest market share in the global automotive heat exchanger market, by application. With the growing demand for comfort and convenience, the adoption of these systems is increasing in commercial vehicles. This is prompting the growth of the air conditioning system segment in the market. The intercooler is estimated to be the fastest growing segment of the automotive heat exchanger market, by application. Rising demand for vehicles with turbocharged and supercharged engines that require intercoolers for functioning is expected to drive the heat exchanger market. 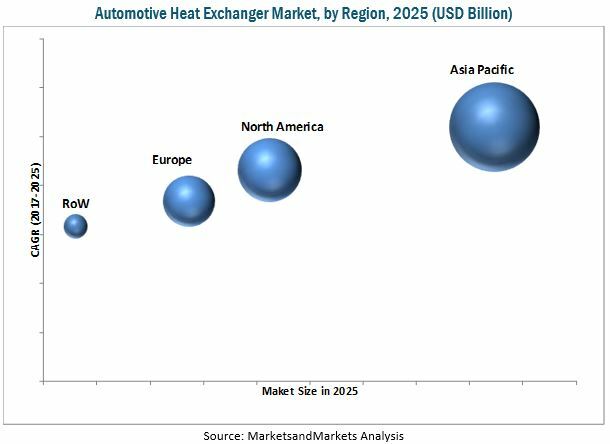 By vehicle type, the passenger cars segment is estimated to hold the largest share of the automotive heat exchanger market. The rise in the production of passenger cars globally, high demand for premium vehicles and SUVs, and expectation of high performance from personal vehicles are fueling the growth of this market. The global demand for passenger cars is larger than that for commercial vehicles and is expected to grow further in the future. Additionally, factors such as the sizeable number of luxury light-duty vehicles in Europe and North America and the increasing demand for these vehicles in the Asia Pacific region are increasing the demand for automotive heat exchangers. By design type, the automotive heat exchanger market for plate bar heat exchanger segment is estimated to grow at the highest rate during the forecast period. This type is mostly used in commercial and off-highway vehicles, which require a high degree of durability. Factors such as the development of infrastructure and increasing demand for commercial vehicles for freight transport are driving the growth of the plate bar segment. By electric vehicle type, the passenger cars segment is estimated to hold the largest market share of the automotive heat exchanger market. The growing demand for alternative fuel vehicles, increasing use of batteries as a primary source of energy in vehicles, and rising concern to reduce global carbon footprints are driving the market for electric vehicles. By off-highway vehicle type, the construction equipment vehicle segment is estimated to be the fastest growing segment of automotive heat exchanger market. Infrastructure development, especially in countries such as China and India, is supporting the growth of this market. 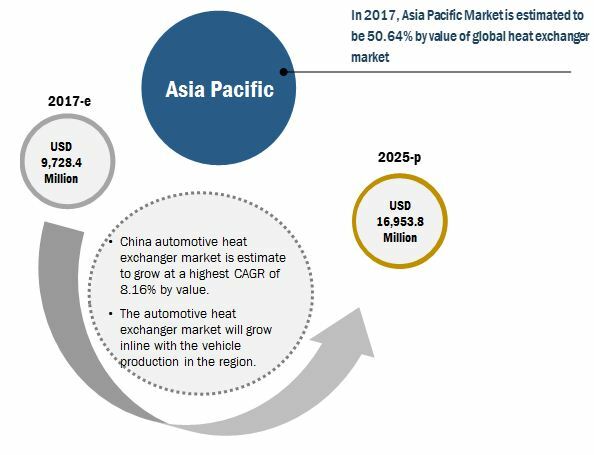 Asia Pacific is estimated to dominate the heat exchanger market for automotive, by volume as well as value. The growth of this market can be attributed to the increase in production and demand for passenger cars and electric vehicles. The increasing demand for electric and hybrid vehicles can hamper the growth of conventional heat exchangers such as radiators, oil coolers, intercoolers, and EGR coolers. These conventional automotive heat exchangers are not used in an electric engine. Instead, electric vehicles have a battery thermal management system for the purpose of battery cooling. Some of the key market players are Denso (Japan), Mahle (Germany), Dana (US), Hanon (South Korea), and Valeo (France). Air conditioning systems for automobiles control the temperature, moisture content, and flow of air inside the cabin and combine the functions of a heater and cooler. Air conditioning systems use a condenser, compressor, and evaporator to maintain the desired operating conditions in the cabin. Exhaust gas heat exchanger systems are used primarily in diesel vehicles to reduce NOx emissions by cooling exhaust gases. With the help of EGR, a controllable proportion of the exhaust gas is recirculated back into the engine. Before sending back to engine this exhaust gases are cooled with the help of EGR cooler. This results in the reduction of the combustion temperature and less nitrogen oxide is produced. An Air-to-Air intercooler extracts heat from the compressed air by passing it through its network of tubes with cooling fins. As the compressed air is pushed through the intercooler it transfers the heat to the tubes and, in turn to the cooling fins. The cool air from outside, traveling at speed, absorbs the heat from the cooling fins reducing the temperature of the compressed air. These intercoolers are designed to cool the air compressed by the turbocharger or supercharger, reducing its temperature and, thereby, increasing the density of the air supplied to the engine. Oil coolers are used to cool oil and hydraulic fluids for engines and automatic gearboxes. The heated lubricant enters the oil cooler where it is cooled down with the help of the ambient air or the radiator coolant. Oil coolers are used in engines, transmission systems, and power steering. Engine oil coolers are needed for high-horsepower engines to ensure the lubrication properties of the engine oil are maintained through any application duty cycle. In automatic transmission vehicles, oil is used as a working fluid and as a general lubricant, which helps dissipate the heat generated by the transmission system. An automatic transmission oil cooler is a remote-mounted heat exchanger that uses engine coolant to cool transmission oil in stainless steel stacked plate coolers. Where will the developments in the automotive heat exchanger market will take the industry in the mid to long term?